The entire egg cylinder was embedded in methacrylate and nearly every 3µm slice was preserved on microscopic slides and stained with toluidine blue. The 21 high-resolution images below go from the dorsal posterior spinal cord near the primitive streak (slice 5), through transverse cuts of both the brain and spinal cord, to the base of the neural groove (slice 87). 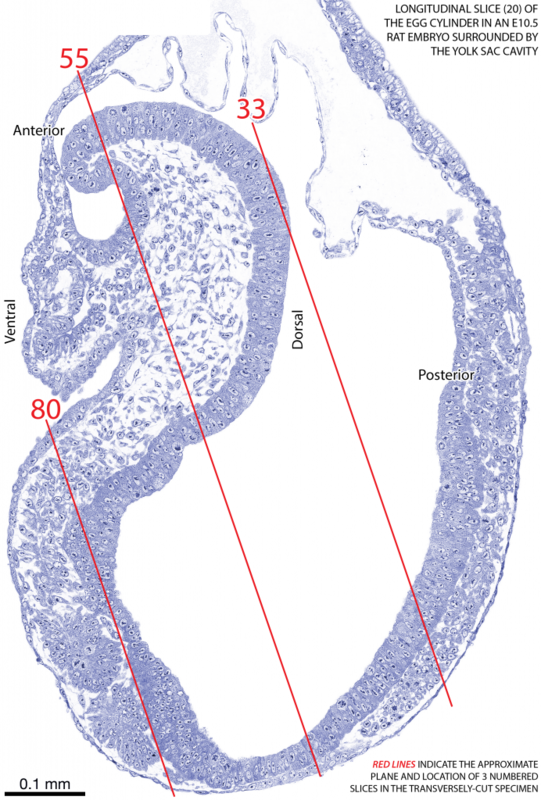 The illustration below shows the approximate cutting plane and location of slices 33, 55, and 80 on a longitudinally-sliced rat embryo at the same age. The nervous system is our chief interest, and most of the annotations in the images below refer to that. At this stage of development, the neural plate is open throughout the entire neuraxis from the forebrain part of the head fold to the area where the primitive streak continues posterior to the spinal cord. There is no neural tube, and no neurons have been generated. Instead, the dense cells in the neural plate are the stem cells that will generate neurons, glia and other cells specific to the nervous system—the neuroepithelium. The neural plate has a deep groove in the midline. In this specimen, the midline itself twists from posterior left to anterior right because the embryo turns as it grows. The midline in the brain is at a different angle than the midline in the spinal cord. This is easy to see in nearly every transverse slice. In addition, nearly every slice shows the notochordal plate in the midline. The notochord always marks the midline area and extends from the most posterior spinal cord to the midbrain. The anterior midbrain and the forebrain do not have a notochord, but they still have a deep groove in the midline.